The Canadian Mint in Ottawa struck gold sovereigns between 1908 and 1919. All of these coins are scarce, some rare, and two of the dates are extremely rare. 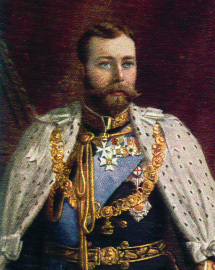 Edward VII was on the reverse until 1910 and after which George V held the crown. Gold Sovereign coins were first minted in 1489 for Henry VII of England. 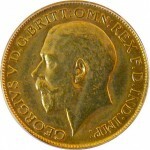 These coins were minted of pure gold and had a face value of £1 or 20 shillings. However, since such coins were considered official bullion, there was no inscription stating their face value. 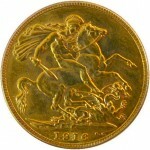 Although, the production of such Gold Sovereigns was discontinued in 1604 and was replaced by Laurels, the minting of these coins was restarted again in 1817. For ten years between 1908 and 1919, The Canadian Mint at Ottawa minted such Gold Sovereign coins. This Ottawa Mint was specially constructed to manufacture such gold coins and on January 2nd 1908, Canada became the first country outside England to mint British sovereigns. All the coins produced during these ten years are extremely rare even today. Other than gold, there were also other coins minted in silver and ordinary base metal. Today, the Ottawa mint is still in operation but is now called The Royal Canadian Mint. Between 1908 and 1919, a total of 628,152 Gold Sovereign coins were minted with its highest productions coming in the years 1918 where 106,570 coins were minted and in 1919 when 135,957 coins were produced. The main reasons why such coins are considered to be quite rare today are that many of them melted down soon after minting, resulting in their destruction. As a result, only a few coins were left leading to their becoming scarce. 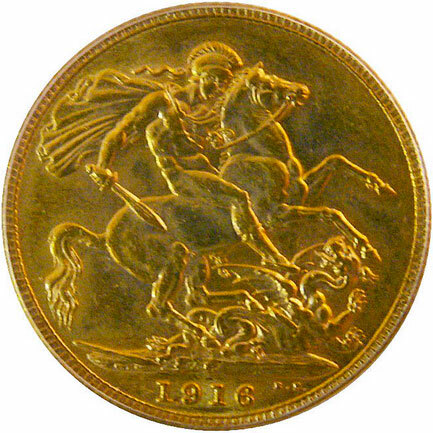 In 1817, when the minting of such Gold Sovereign coins had restarted, the front portrait was that of King Edward VII and was done by G. W. de Saulles whereas the reverse portrait was prepared by Benedetto Pistrucci and depicted Saint George astride a horse slaying a dragon. 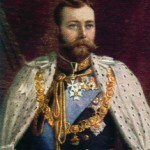 As a referral, every Canadian Sovereign gold coin minted in future included the letter ‘C’ under this image to denote that they were minted in Ottawa.